As part of the national scheme of “fostering individuals who create change and new values, and who lead in each field of society” thereby “developing human resources for a brighter future,” our school has been assigned to be one of 56 Super Global High Schools that “nurture students who are internationally well-grounded.” (MEXT) To this end, we have tasked ourselves with the mission to equip our students with negotiation skills to reach a win-win agreement. We believe that, for a sustainable and peaceful relationship, any party involved, be it a peer or another country, needs to come out of the dialogue satisfied. Although this is not an easy task, we will take a multi-faceted approach: instigating cross-subject studies on shoku; promoting English communication skills; and hosting international dialogues. We chose shoku for our common topic for cross-subject studies. Shoku is a Japanese term that encompasses everything related to food. In biology, a student may study GMOs. In social studies, a student can examine the world trade of agricultural products. 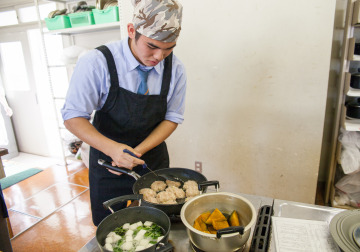 In home economics, a student may learn various culinary techniques. In this way, students can choose a field of their choice to approach various issues connected to our diet and share their findings with their peers to gain a multi-perspective understanding. To promote English communication skills, our Eigo Hyogen, translated as “English Expression,” classes will be dually taught by Japanese and native English teachers. Students will be exposed to authentic English on a regular basis and be able to hone their listening capacity. With a high student/teacher ratio, there will be more attention paid to group work where students can practice their communication skills. Through group work, students will be introduced to different perspectives. 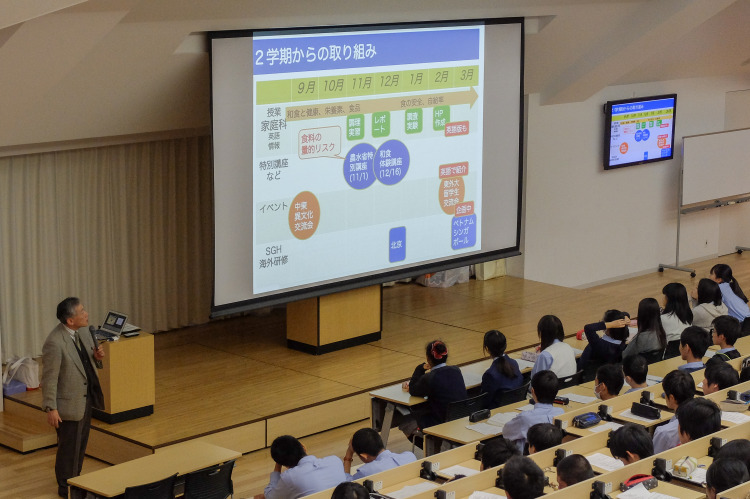 We will put in all possible resources in our challenge to maximize students’ potential to hold a constructive conversation in English, which consequently meets the Eigo Hyogen objectives administered by the Japanese Ministry of Education. Aside from discussions held in class, we will host a number of opportunities to hold an international dialogue. There will be school trips to study shoku related subjects in Vietnam, Singapore, and Beijing, and have dialogues with the local people. We will invite international students at Tokyo University of Foreign Studies to discuss matters concerning shoku. We aim to ultimately host an international conference where all present will be invited to share their opinions on different aspects of shoku issues. High school students around the world will be invited to partake in the dialogue. We will be working in collaboration with students and teachers from Tokyo University of Foreign Studies in SGH related activities. For our cross-subject studies, we will conduct presentations and receive feedback from the university students. We will ask professors to monitor our Eigo Hyogen and improve the content based on their feedback. Most importantly, we will welcome the teachers and the students as honored guests at the international conference. Our assignment to a Super Global High School has provided us with an exciting opportunity to learn more about our world. We are, after all, what we eat, and tracing down what we put in our mouths will surely lead to a better understanding of agriculture, the world trade, our culture, and our priorities. We are thrilled at the prospect of learning different aspects of this subject from people of different backgrounds. Creating analytical yet compassionate thinkers has always been our school goal and this assignment will prove to be the perfect platform. Please join us in our challenge of reaching international win-win negotiations on shoku. 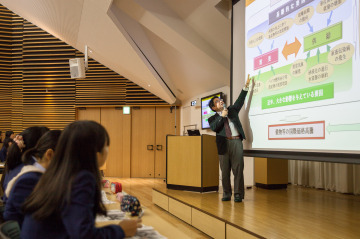 Our Eigo Hyogen II classes are designed to nourish effective negotiation and critical thinking skills by addressing relevant global issues in a dynamic class environment. Students benefit from the support offered by two teachers; native English speaking teachers and Japanese teachers. The classroom atmosphere is vibrant and naturally lends itself to student initiated dialogues. The course is guided by Super Global High School objectives in that it provides a context for students to understand and practice mutually beneficial conversations. In the first year of our SGH program, students are taking part in workshops and lectures to learn more about our shoku culture. Now students have a better understanding of what they eat, where it comes from, and how it is prepared and consumed. The knowledge that they have gained in these projects will help them better understand global issues related to food in the future. The following projects are our different approaches to understanding the Japanese shoku. Our school had the honor of receiving seven college students from Turkey, Iran, Jordan, and Dubai. The program provided the perfect opportunity for our 55 first-year students to learn about Halal food and the culture behind it. In this enlightening lecture, 1st year senior high students learned the seriousness of global food shortage and the factors that impact commodity prices. Dr. Kabuta further analyzed Japan’s competitiveness in the world food market, and proposed strategies to strengthen its agriculture. Students were very engaged and had a lively dialogue afterwards asking Mr. Kabuta a wide range of questions. In home-economics, first year senior students prepared a basic Japanese meal with miso-soup, one meat or fish dish, two vegetable dishes and a bowl of rice. They learned the importance of the dashi (fish broth or konbu stock) in Japanese cooking. Individual homerooms have chosen an ingredient to report on. They will share their findings with their class in a workshop on February 28. The array of ingredients include dashi, miso, soy-sauce, other soy-bean products, wheat, rice, pickles, seaweeds, salt, and water. 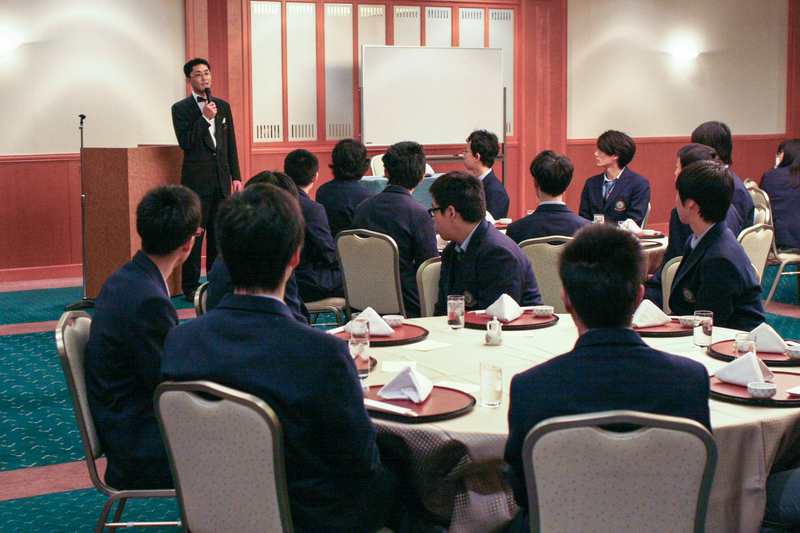 52 students dined at the Hotel Green Tower Makuhari on the 17 of December for some tips on Japanese table manners. Four students visited Yue Tan Middle School to exchange thoughts on food sources and transportation while renewing friendship with the school. Students were also introduced to food safety networks implemented in China. There will be other shoku related research trips to Vietnam and Singapore in March. Drawing from his experience of living on the Navajo Reservation and attending their college, Mr. Fukuda stressed that foreign contact arouses self-awareness. On the reservation, while people strive to preserve their native heritage, they are increasingly influenced by popular American culture. For example, salt is sacred and an important cultural element, and so is prevalent in their diet. However, Native Americans also consume sugary carbonated beverages regularly, which is indicative of the modern American influence. These observations prompted Mr. Fukuda to gauge what comprises the Japanese diet.